I will brighten your life in Me, says the LORD. I will give you everything that you need. Do not look for someone else to supply your needs. Look onto Me. For I have a bountiful supply for you that will never run out. You are not exempt from My daily blessings and provision for you as you entrust your total care onto Me. I will not ignore the cry of your heart or pass by you while I attend onto someone else instead. You are My beloved child and you will receive My attention and help, says the LORD. 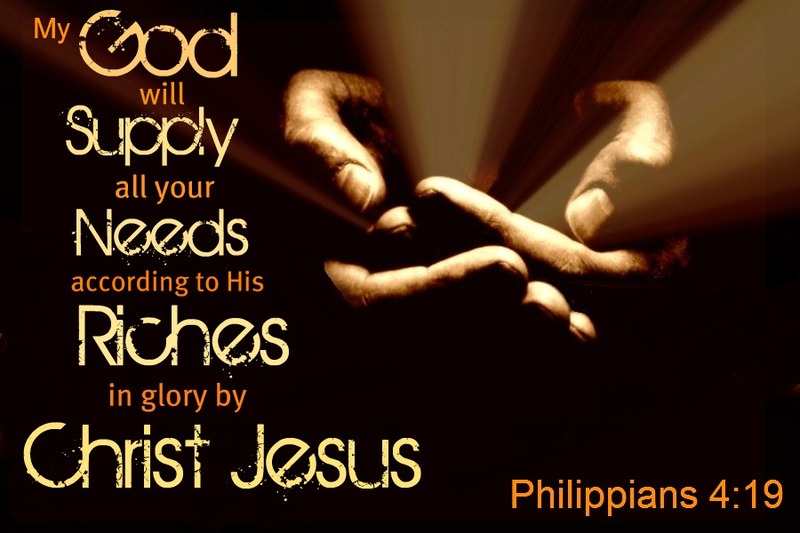 I will open My hand wide unto you and freely give you more than enough, says the LORD. You will be blessed to be a blessing. Though the arms of the flesh have failed you many times, I cannot and will not fail you. I Am always dependable and trustworthy. You are under My protective wings and I will under gird you, support you and keep you from falling apart. I will strengthen and help you. Come into My presence and eat at My table that is loaded with an abundant supply for you. You will not need to go without, for what I have for you is never inadequate and I Am always your source and sufficiency in all things, says the LORD. WOW WOOOOOOOO HOOOOOOOO THANK YOU HOLY SPIRIT. AAAAAAAMMMEENNNN AND AAAAAAAMMMEENNNN. I RECEIVE THIS POWERFUL WORD DECLARATION IN THE MIGHTY NAME OF JESUS AND ALL GLORY TO GOD ALONE AAAAAAAMMMEENNNN AND AAAAAAAMMMEENNNN! Wow!!! Amen!!! Thank You Abba Father!!! THANK YOU IN ADVANCE FATHER FOR OVERFLOW AND ABUNDANCE EXCEEDINGLY TO BUILD THE KINGDOM OF GOD!!! !PRAISING YOU FOR PROTECTION, STRENGTH, DEPENDABILITY AND FAITHFULNESS!!!! Jesus what a Wonder You Are. Thank you Father for all your goodness! God you are so Good all the time and all the time you are Good! I love evry spoken words you speak each and every moment of my life. Glory to God !